I put off opening my Christmas gifts until everyone had finished opening theirs. A pile of brightly wrapped packages sat on the floor around me. I had to be careful not to crush the boxes with the legs of the rocking chair. Basking in the happiness of watching my grandson yelp and scream as he opened his toys, I patiently waited. When it was my turn, I opened all the little gifts first. I received a bottle of my favorite perfume, a gift card to buy books, and a lavender-scented candle. Then there was a massive box. This was a gift from my mother and it had rested under my Christmas tree and had teased me for weeks. When I was a little girl, the anticipation of Christmas morning drove me crazy. Often, I peeled the tape off one of my packages to see what was hidden inside. My family has teased me since and they take care to tape my gifts extra tight alleviate the temptation. What they do not realize is that now, I relish the anticipation. Being surprised is better than knowing. This package, I noticed, was lacking the usual amount of tape. Maybe my mom had begun to believe that I no longer cheated and peeked at my gifts. I picked up the huge box and set it on my lap. I tilted the rocking chair back a bit to arrange the box so I could open it. I knew it must be something good, because my son-in-law was standing ready to snap pictures. My mom had called twice to see if I had opened my gifts, yet. Anxiously, I pulled open the box and the contents spilled out across my lap. 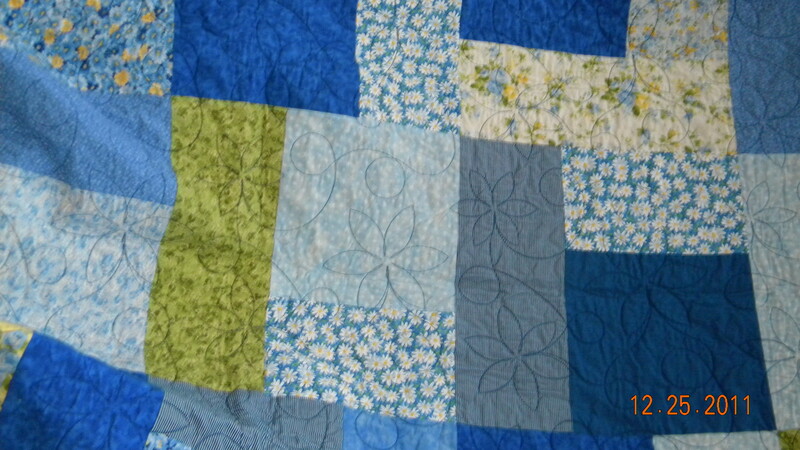 As I palmed the beautifully stitched quilt, tears began to form. The fabric was soft and smelled new. The colors, bound superbly together, were perfect. All of my favorite shades of blue and white joined with just a touch of yellow. It was a bright and sunny cover. However, what made me hiccup in tearful happiness, were the daisies. They were interwoven in the quilting and in the fabric. They told me that my mom loved me. I know that my mom shopped for months to find the perfect fabrics and colors for my quilt. Every winter, she takes a month-long trip and visits quilt stores all over the country. My quilt is made from fabric from Arizona, Texas, California, to name just a few stops my mother made. She thought about me for days when she was shopping, cutting, sewing, and binding. She put her heart and soul into every stitch with only me in mind as she was creating. What could possibly be more special? Not only did my mom make me an heirloom quilt for Christmas, she also gave me a piece of herself. My king-sized creation warms me at night, but more importantly, it warms my heart every time I think about the time and thought that went into making it. It is truly a piece of art that I will treasure, forever. The quilt is one of my favorite things, and it holds stitches of motherly love in every fiber. Posted in Words of Wisdom and tagged beauty, christmas gift, DPchallenge, Grandmother Musings, Happiness, love, Mom, Mother, postaday, Quilt, Stitches of Love, Tears, Weekly Writing Challenge: A Few of my Favorite Things. Bookmark the permalink. Treasured and priceless gifts….I treasure the baby blankets my mom knit/crocheted when my kids were little and now that she’s gone, these items are even more special. A wonderful warm gift which can’t be forgotten.